Home | News | General | 2019 Presidency : Who is this Olawepo-Hashim? 2019 Presidency : Who is this Olawepo-Hashim? The race for the 2019 presidential election has begun in earnest. In the All Progressives Congress, APC, the candidature of the incumbent president, Muhammadu Buhari, is a fait accompli. Nevertheless, four aspirants, with little or no political weight, want to square up with him at the party’s primary. This will give the process a semblance of egalitarianism. In the major opposition party, the Peoples Democratic Party, PDP, no fewer than ten aspirants are in the jostle for the ticket. Unlike the APC, the PDP parades those considered to be formidable politicians judging by their pedigrees and antecedents. The list of aspirants includes a former vice president, Atiku Abubakar; former Jigawa state governor, Sule Lamido; former Sokoto state governor, Attahiru Bafarawa; former Kano state governor, Ibrahim Shekarau, former Kaduna state governor, Senator Ahmed Makarfi; a former member of the Senate, Dr. Datti Ahmed; and, former minister of special duties, Tanimu Turaki, SAN. Others are: outgoing governor of Gombe, Ibrahim Dankwambo; incumbent governor of Sokoto, Aminu Tambuwal; a serving senator and former Kano state governor, Rabiu Kwankwaso; and, the incumbent senate president, Bukola Saraki. Apart from Atiku, Lamido and Kwankwaso whose political odysseys date back to the ill-fated Third Republic, the others are creations and products of the politics of the Fourth Republic where the shape, texture and content of politics and politicking are defined by narrow interests, sans philosophical details. But the politics of the First and the Second Republics was, indeed, robust for its ideological flavours and this had some positive influence on that of the Third Republic that was superintended and tempered by the diarchical regime of General Ibrahim Babangida. The calibre of candidates for the presidential elections at those intersections was not in doubt. There was intellectual depth and gravitas. And, where intellectual depth was lacking, the candidates made up for it with their political experiences, abilities and dispositions to provide strong leadership. Presently, the lack of ideological savour and intellectual rigour has largely discounted the majesty of the contestations for presidential power. The field comprises contenders and pretenders. Pretenders now populate a vast majority of the political party platforms whose agenda is just to appear on the ballot, perhaps for pre and post-election bargains. However, in contradistinction is the magnitude of the presidential intention of Gbenga Olawepo-Hashim, on the political platform of a freshly-minted party, Alliance for New Nigeria, ANN, whose commitment is grounded on a clear ideological foundation that has its history in the avant-garde politics that was nurtured and tempered in the social milieu of the nation’s tertiary institutions, beginning from the mid-eighties. That solid political background, coupled with twenty-six years of successful business history especially in the oil sector, has not only prepared him for ideological national politics but has also set the tone for his strategic and surefooted quest for the nation’s topmost job. Indeed, the entirety of his commitment-both ideologically and financially to the burgeoning countrywide movement, defines who he is: a politician with a passion to redirect development narrative through provision of transformational leadership and inspiration of a national rebirth. Significantly, he pursues his mission and vision on the basis of those essential principles. In showing fidelity to principles, he does not care if he stands alone in the process. Olawepo-Hashim has consistently spoken truth to power even in situations where he was an insider. Having won election as deputy national publicity secretary of the PDP in 1999, he led a protest within the party for the entrenchment of internal democracy and due process when the leadership set out to illegally extend its two-year tenure other than by constitutional means. Whereas, Olawepo-Hashim stood to benefit from the process; he opposed it on the ground of its unconstitutionality. The PDP, with Barnabas Gemade as national chair, consequently expelled him along with some founding leaders like the late Chief S.B. Awoniyi, Alhaji Bamanga Tukur, the late Chief Edwin Ume-Ezeoke, the late Professor Emmanuel Osammor and Chief Don Etiebet who had, before his internal dissension, protested the flawed national convention that produced Gemade as national chair. Not many politicians can sacrifice their comfort zones on the basis of some principles in political environments where morality has no footing. But, then, Olawepo-Hashim’s life typifies the struggle, always ready to put his life in harm’s way for protection and advancement of his political beliefs. Indeed, he has been an inner driven person as once attested to by former minister of foreign affairs, the late Chief Ojo Madueke. Olawepo-Hashim’s trajectory in political activism began while at the School of Basic Studies where he was elected as General Secretary of the Anti-Apartheid Association, Youth Solidarity on Southern Africa. In 1988, he was elected one of the leaders of the very active National Association of Nigeria Students, NANS. He was incarcerated under the Detention of Persons Decree 2 of 1984 (as amended in 1989) for his leadership role in the 1989 anti-Structural Adjustment Programme, SAP, protests and his pro-democracy activities. He was consequently adopted by the Amnesty International as a Prisoner of Conscience in 1989. A notable pro-democracy figure in the then Global Pro-Democracy resistance of the late 80s and a respected youth leadership voice from Africa, Olawepo-Hashim played a prominent role in the 13th International Festival of Youths and Students in 1989 in Pyongyang, North Korea. In 1990, he became the national administrative secretary of the National Consultative Forum led by the indefatigable patriot and democrat extraordinaire, former president of the Nigerian Bar Association, NBA, Mr. Alao Aka Bashorun. The group had in its fold the technocratic group led by Alhaji Damshida, Chief Tayo Akpata and Chief Phillip Asiodu, among others. It also had a political group led by former Zikist activists such as Chief Kola Balogun, Chief RBK Okafor, Senator Mahmud Waziri and Alhaji Tanko Yakassai. The group was the first to canvass the imperative of power devolution and the convocation of national conference as a programme of democratisation of Nigeria under military rule. Olawepo-Hashim, a graduate of Mass Communication from the University of Lagos and Masters Degree holder in Global Affairs from the University of Buckingham, United Kingdom, received mentoring into partisan politics under the progressive leadership of the late Chief Solomon Lar and the late Alhaji Abubakar Rimi; and, worked actively in the years of the G-34 initiative at the group’s secretariat where he was in charge of publicity. Following Obasanjo’s election as president in 1999, he had, in the intervening transitional period, served as member/secretary, Youth and Women Development sub-committee of the General T.Y. Danjuma-led Policy Advisory Committee with the late Hajia Laila Dogonyaro as chair of the sub-committee. In 2003, Olawepo-Hashim was appointed as a member of the Political Advisory Committee to the President (in the office of the Political Adviser). 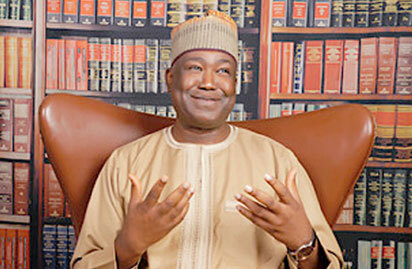 Today, Olawepo-Hashim, born of a Yoruba mother and a Hausa father from Kebbi, has launched an audacious presidential enterprise on the ANN platform with which, together with Nigerians of like-minds, he wants to galvanise national oppositional momentum against the APC and the PDP that had both failed, according to him, to provide good governance. Ojeifo, an Abuja-based journalist, writes via ojwonderngr@yahoo.com.